After spending Thursday at home curled up with a migraine, I wasn't surprised when Friday quickly flew by. A day spent catching up on emails practically demands an evening spent catching up with friends, and having our Friday night foursome reunited recently has been good for the soul. After sampling some saisons–good, bad, and truly awful–at Social, we dashed across the street for curries and naan at Masala. After a fabulous evening, John and I headed home to catch up with the inmates at Litchfield, and I'm certain we weren't the only ones watching! We were up early on Saturday morning, and while John picked up breakfast supplies at our favorite grocery store, I was grinding coffee and brewing tea. Poached eggs over avocado toast with roasted fingerling potatoes might seem like they'd eventually get boring, but it certainly hasn't yet! We finished the episode of Orange Is The New Black from the night before, then tackled our to do lists. After a few hours of productivity, we jumped in the car and headed across town to a restaurant supply store, where we found our perfect flatware to pair with the new dishes and glasses gifted to us. Then, to support our recent passion for learning languages (I spend my morning train ride glued to Duolingo), we looted the children's section of the public library for books in French and Spanish, including a complete set of Beatrix Potter stories, which were my earliest memories of childhood reading. Back at home, we whipped up a big salad full of heirloom carrots and thinly sliced French breakfast radishes. After one more episode of OITNB (we can't stop! ), John took off for a run while I settled back in with my laptop to get some work done. That evening, we cooked a simple paella together, and washed it down with two petite glasses of rosé–it was National Rosé Day, after all! On Sunday morning, there were pancakes with two of John's favorite condiments–rich French butter and Grade B maple syrup–and strawberries, bananas, and raspberries. They were the perfect antidote to the changeable San Francisco summer weather, as was the big pot of tea we made for sipping as we practiced our French. I spent some time with some old music school textbooks brushing up on the basics, and we both curled up under the covers with our current reads for a truly perfect Sunday. After a bit of housekeeping and some exercise, we were ready for an early supper; the simple tortilla John whipped up was perfect for dinner, and will be just as good for breakfast on a hectic Monday morning. After a foggy stroll through the park, we curled up for one last visit to Litchfield before the week began. Tell me, what were you up to this weekend? Sipping rosé in the sunshine, starting a new project, or did you get hooked on a cult tv show? 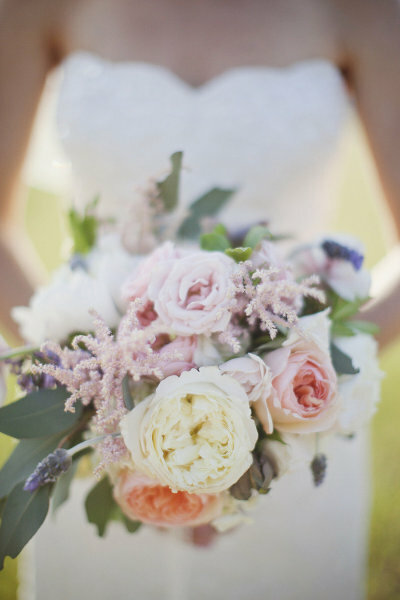 Image by Stephanie Williams Photography, lavender bouquet with garden roses by Peony & Plum. Sounds like the perfect weekend to recover from a migraine. My weekend was spent relaxing at my BFF's house by the river after a week of packing, moving and turning in the keys to our rental. And some more wedding planning before next week! Ahh! Luckily they only come around once a year, but they definitely demand that I slow down for a day! I'll have to give "Renovation Realities" a watch–we've been addicted to the original Iron Chefs lately!